Louise Gouge here, wearing the plaid and celebrating my Scottish heritage, just as Cynthia celebrated hers yesterday. As promised last month, I’m continuing to discuss my ancestral connections who came to the shores of what is now the United States. I don’t have a great deal of information to go on with my Scottish heritage except that my paternal grandmother’s maiden name was MacCaskill. Like many Scottish surnames, this spelling is just one of many, but most of them seem to refer to a “sept” of the Clan MacLeod of Lewis. (There’s also a MacLeod of Harris.) Historically in Scotland, a sept was a smaller clan (family) that attached itself to a greater clan for protection and shared resources. But being a smaller sept didn’t mean the MacCaskills were considered inferior. One William MacCaskill led the entire MacLeod clan against a fleet at Clanranald at Eynot. No doubt he was chosen to lead because the MacCaskills were skilled seamen and sailors. In the mid-nineteenth century, Angus MacAskill (note different spelling, but same family) grew to be 7 feet 9 inches tall. Naturally, he was called The Giant. Don't you just love these old crests? This is the MacLeod of Lewis crest. I love that the motto is "Hold Fast." No wonder I'm so tenacious! That's a bull in the center. Yes, I suppose I can be bull-headed sometimes. The background plaid is the MacLeod tartan. How would you like to call this little place home? Here’s a picture of the Clan MacLeod family seat at Dunvegan Castle (for over 800 years), the oldest continuously inhabited castle in Great Britain. Rather romantic looking, don’t you think? My family loves to participate. Some years ago, my younger son became interested in his Scottish heritage, having married a lovely lassie whose father is from Scotland. (Her father has that charming accent and even plays bagpipes!) They became involved with organizing the Central Florida Scottish Highland Games, serving on the Games committee, and eventually pulling my husband and me into the fun. Here are Timothy and Heidi Gouge at the 2013 Central Florida Scottish Highland Games kickoff dinner. Now we have the next generation joining us. This year, our twelve-year-old grandson entered the Games and placed second in his age group (which went all the way up to 15) in the ax throwing contest. Way to go, Forest. In addition, this year the Central Florida Scottish Highland Games were honored to have a Princess Merida lookalike (from Disney’s movie Brave). Here’s Miss Caitlyn Boyd all the way from Scotland posing with my beautiful granddaughters, Savannah and Emmy. Emmy looks like she just stepped out of that MacLeod castle, doesn't she? No doubt you remember that those Scots were a rowdy bunch and often fought amongst themselves, as well as fighting the English. But the annual Games are a wonderful way to celebrate all the best of Scottish culture without any of the crazy stuff that makes up every people group. My favorite thing is to see my dear hubby in his dress kilt made from the United States Army tartan. Those medals on his chest were earned in Viet Nam, where he served in the 101st Airbourne. And yes, I love haggis, that unique Scottish culinary delight, which I suspect American Scots have adapted to our more tender appetites. In the next couple of months, I’ll be discussing my other ancestral connections, including some of those empire-building English and a few poetic Welshmen. The Welsh connection is a bit vague, but it shows up in the DNA, so I hope to find out some interesting details. Please come back to see what I’ve learned. You gotta love these giveaways! Do you have a Scottish connection? I’d love to hear about it. Leave a comment, and be entered in our drawing. At some time this month, I’ll be giving away a set of my Revolutionary War novels from Harlequin’s Love Inspired Historicals. Great post Louise! Nope, no Scottish connection here. Thanks for sharing your family with us, love the pictures. Your husband looks so dapper in his dress kilt. Did your grandson have to wear a kilt to be in the contest? Or did he wear what he's wearing in the picture? Just curious. God bless. Thanks for your comment, Debbie. Kilts are optional for the children's events, but these event have professional athletes who travel all over the country competing in the various regional Games. Those men and women wear their kilts. You should see the muscles on those athletes! Sounds like a lot of fun. Thanks again for sharing. I'm the same as Bethany above. No Scottish conections that I know of, German and English are what I have heard of. I've researched what I can of my family history. My maternal grandmother's maiden name was Maclean. This is the Maclean of Duart (on Mull), and the motto is Virtue Mine Honour. I never got to Duart Castle when I lived in Scotland but, weirdly enough, my English father has visited more than once! I'm still trying to trace my maternal grandfather's line. His name was Panton and I've traced back to around 1800, but I don't know which clan the Panton line is part of. What I do know is that everyone is from the north of Scotland, east and west. I don't think I have a Scottish connection in my family. 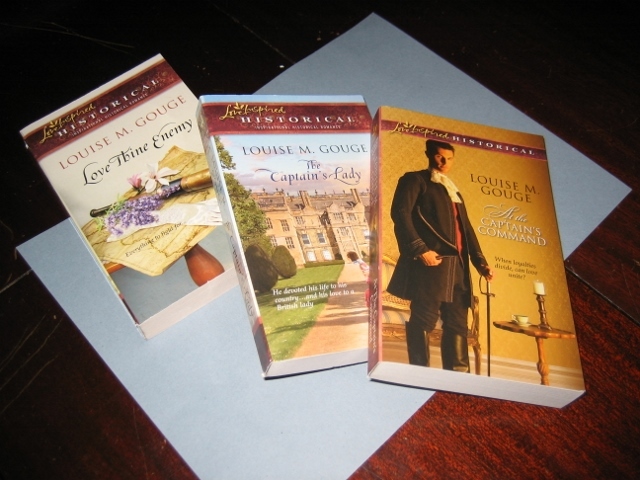 I would love to be entered in the giveaway for your Revolutionary War novels. I love reading books set in that time period. What a fun post Louise! I love researching family history. No Scottish blood in my veins - I'm from South Louisiana and have a mostly French and Spanish heritage. My hubby might have a touch of it though. Enjoyed your blog - my maternal ancestors are from the MacGregor clan. Thanks for the opportunity to win the set of books! I have Scottish on my Dad's side, but I don't know how far back. involved in the games and learning about their Scottish history. :) My dad always claimed we are Scot-Irish on his side of the family, so I suppose I can claim a wee bit of Scot in my heritage. Love the post! I have Scottish and Irish connections. The Scottish is all the way back to Braveheart - I'm quite proud of that one!! Oh I wish I could have met them all. Yes, I do have Scottish ancestral roots, as I was lamenting about this a second ago on Ms. Hickey's posting!! And, although I am a second generation Scot, I wish I could say I know more about the areas of Scotland we're from and stories of course, that would be tied to the Highlands. I do know that my grandmother didn't want to leave Scotland, so this is perhaps why I don't know as much as I could have!? I have heard of the Scottish Games that go on during the year, and one day, I'd like to take a more active interest in that side of things! :) It would be nice to dig deeper into research, learn about the family clan and tartan, as much as sort out how we have a family sword! I truly enjoyed listening to your Scottish roots, but after seeing Monarch of the Glen's episode about haggis, I think I'll take a pass! Oyy. Blessings and museful thoughts on our Scottish relatives! of work? I've virtually no understanding of coding however I had been hoping to start my own blog soon. Anyway, if you have any recommendations or techniques for new blog owners please share. I know this is off topic but I just needed to ask. Thanks!